Panabo City‘s Mark Anthony Barriga starts the Philippine campaign in the 2011 World Boxing Championships on the right foot as he defeat Romanian Stefan Caslarov, 12-5. 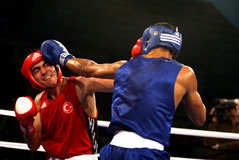 The AIBA World Boxing Championships is the first qualifying event to the 2012 London Olympics. Barriga, the light-flyweight bet of the Philippine team that is is bankrolled by the Philippine Sports Commission and supported by PLDT, Accel Powerade and Clusivol, hopes to land in the Top 10 to get the coveted spot in the London Olympics. Barriga will next face Paddy Barnes of Ireland. Barnes is the 2010 European Champion and 2008 Olympic Bronze medallist. Barriga won the Sydney Jackson Memorial Tournament in Uzbekistan earlier this year. BAKU, Azerbaijan—Light flyweight Mark Anthony Barriga gets the PLDT-national boxing team’s campaign going when he tangles with Romanian Stefan Caslarov on Monday (Tuesday in Manila) in the inaugurals of the 2011 Aiba World Boxing Championship. Guangzhou Asian Games gold medalist Rey Saludar will see action Tuesday versus Canada’s Tanjit Lally in the flyweight division. Joan Tipon, the 2006 Doha Asian Games champion, takes on Alberto Melian of Argentina in the bantamweight division on September 28 followed by Delfin Boholst against the Netherlands’ Stephen Danyo in the welterweight category on September 29. Light welter Rolando Tacuyan takes on Iran’s Mehdi Toloutibandpi on September 29 while lightweight Charly Suarez sees action on October 1 against Ecuador’s Luiz Porozo. The biennial championships, which will last until October 8, lured a record field of 570 boxers from 130 countries this year. The national boxers’ trip in this qualifier for the 2012 London Olympics is bankrolled by the Philippine Sports Commission and supported by PLDT, Accel Powerade and Clusivol. The top 10 boxers in each weight division (except heavyweight and super heavyweight, which is top six) will qualify for the 2012 London Olympics.